When Delta introduced new uniforms for employees in Airport Customer Service, Cargo, Ground Service Equipment, In-Flight Service and TechOps earlier this year, more than 350,000 pounds of retired textiles were donated and diverted from landfills in what was one of the largest, single company textile diversion programs in U.S. history to date. 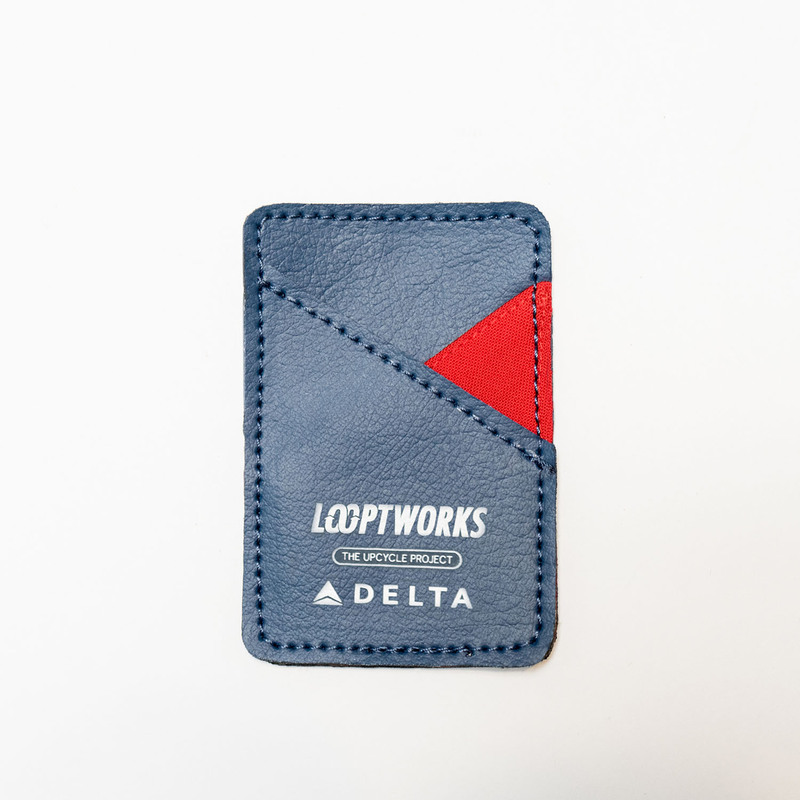 Instead of creating waste in landfills across the country, retired uniforms were donated to people in need, recycled or transformed into new, upcycled products through Delta's partnership with Looptworks. 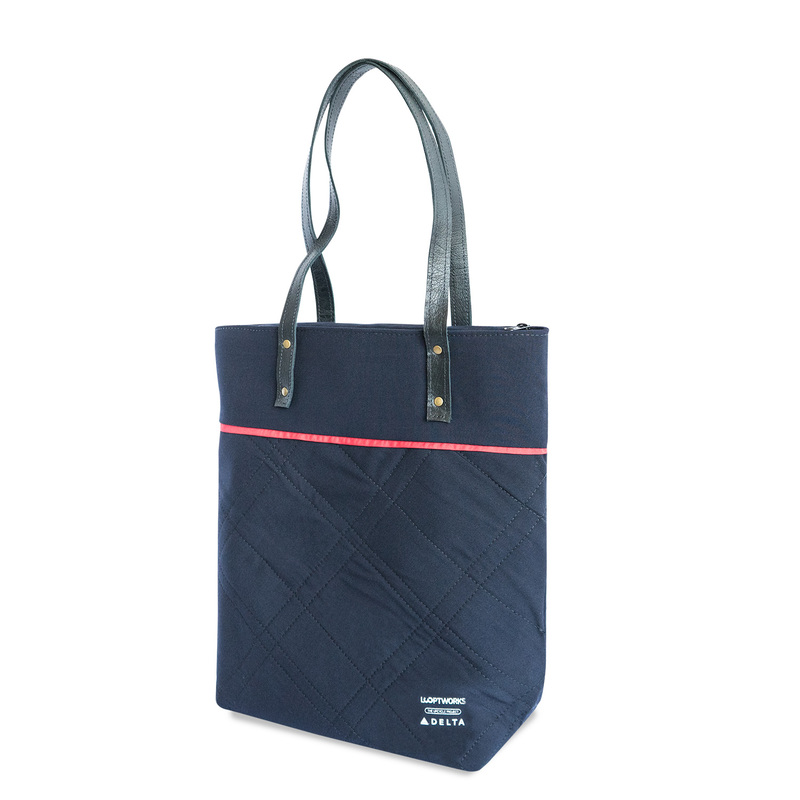 Delta's new collection of upcycled goods, now available for purchase at www.looptworks.com/delta, includes backpacks, travel kits, passport covers, other bags and accessories. The unique collection gives customers and employees the opportunity to own a piece of Delta history. 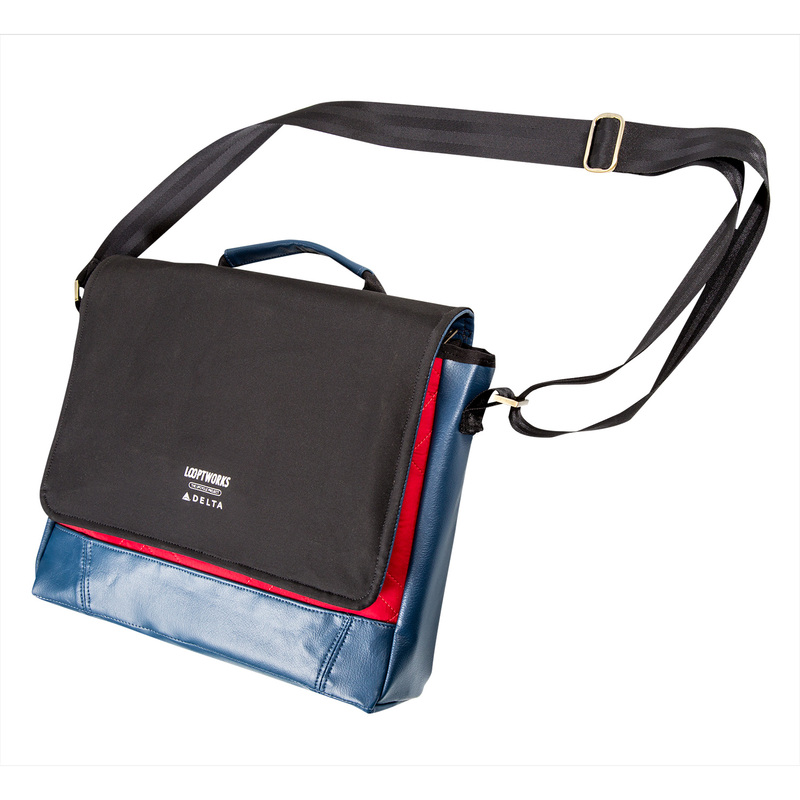 Iconic retired uniform pieces like the red dress, navy suit and black trench coat live on as unique travel accessories. "Our partnership with Looptworks gives new life to retired uniforms and seat covers that would have otherwise ended up in landfills, supports Delta's commitment to serving local communities and provides one-of-a-kind goods that are perfect for gifting, all while being made in the United States,” said Ekrem Dimbiloglu, Director — Uniforms. To add durability and design interest, leather from retired aircraft seats has also been upcycled and woven into select products. Delta fans, employees and frequent fliers can rest assured knowing that their purchases are sustainable and benefit a number of worthy causes. And a portion of each item sold will be put toward the Youth Environmental Education and Action Fund through the Captain Planet Foundation. Orders will arrive by mail, and customers are encouraged to share the story behind the products using #TheUpcycleProject on social media. The purchase of items from the collection also supports Relay Resources in Portland, Oregon and the Bobby Dodd Institute in Atlanta — both of which provide employment opportunities for refugees, workers with disabilities and people in other challenging scenarios. With the help of these organizations, uniforms and other materials were collected, sorted, deconstructed and warehoused in preparation for the project. "The leather Delta uses is very durable and begins its life as a waste product from other leather manufacturing," said Marcus Griffin, Program Manager — Cabin Maintenance. "It's exciting to see a material we originally selected for its durability and environmental benefits continue to be upcycled and yet again given new life." Beyond the upcycled products included in the new Delta collection, retired uniform pieces in good condition are being put to work as clothing donations for those in need. The Salvation Army is selling non-branded Delta items with 100 percent of all proceeds benefitting the organization's Adult Rehabilitation Centers across the country, and Covenant House Georgia has given gently used uniform pieces to homeless youth attending job interviews. Items that were unable to be upcycled or donated have been disassembled and downcycled for use in home insulation, pillows, pet bed stuffing and more. Delta's move to recycle retired uniforms is part of its industry-leading sustainability strategy to drive significant reductions in waste and emissions over time. Delta is the first U.S. airline to offer carbon offsets to customers and the only airline to voluntarily cap carbon emissions at 2012 levels by purchasing carbon offsets — more than 2.5 million in 2017 alone, and almost 9 million carbon offsets since it started. Delta was also the first U.S. airline to recycle aluminum cans, plastic bottles and cups, newspapers and magazines from aircraft and has recycled more than 3 million pounds of aluminum from onboard waste — equivalent to 22 Boeing 747s — over 10 years. The funds from that program and recycling oil and scrap metal in Tech Ops have been used to construct 12 of the 264 homes Delta has built with Habitat for Humanity globally. In 2018 Delta developed first-of-their-kind partnerships with Duke University Athletics and the Seattle Seahawks to offset travel with local benefits. These kinds of efforts and more speak to why Delta was selected as the Keep America Beautiful 2017 Vision For America Award recipient, and has been named to the Dow Jones Sustainability North America Index for eight consecutive years and the FTSE4Good Index for four consecutive years. Delta Air Lines serves more than 180 million customers each year. In 2018, Delta was named to Fortune's top 50 Most Admired Companies in addition to being named the most admired airline for the seventh time in eight years. Additionally, Delta has ranked No.1 in the Business Travel News Annual Airline survey for an unprecedented seven consecutive years. With an industry-leading global network, Delta and the Delta Connection carriers offer service to 304 destinations in 52 countries on six continents. Headquartered in Atlanta, Delta employs more than 80,000 employees worldwide and operates a mainline fleet of more than 800 aircraft. The airline is a founding member of the SkyTeam global alliance and participates in the industry's leading transatlantic joint venture with Air France-KLM and Alitalia as well as a joint venture with Virgin Atlantic. Including its worldwide alliance partners, Delta offers customers more than 15,000 daily flights, with key hubs and markets including Amsterdam, Atlanta, Boston, Detroit, Los Angeles, Mexico City, Minneapolis/St. Paul, New York-JFK and LaGuardia, London-Heathrow, Paris-Charles de Gaulle, Salt Lake City, São Paulo, Seattle, Seoul, and Tokyo-Narita. Delta has invested billions of dollars in airport facilities, global products and services, and technology to enhance the customer experience in the air and on the ground. Additional information is available on the Delta News Hub, as well as delta.com, Twitter @DeltaNewsHub and Facebook.com/delta.